Have you got a huge store, where you can put lots of products? Wonderful, you can offer your customers a wide selection of items, you can let them choose, lots of customers can buy from your store and invite friends to buy there because you offer much. Wonderful! But... are you sure they will not get lost? And if you wanted to make one or more items stand out? If you want to highlight some of them? Put them on sale or make a special temporary offer for them? Users might fail to see the offer among the many products that you show. So how to make your products stand out in your shop? 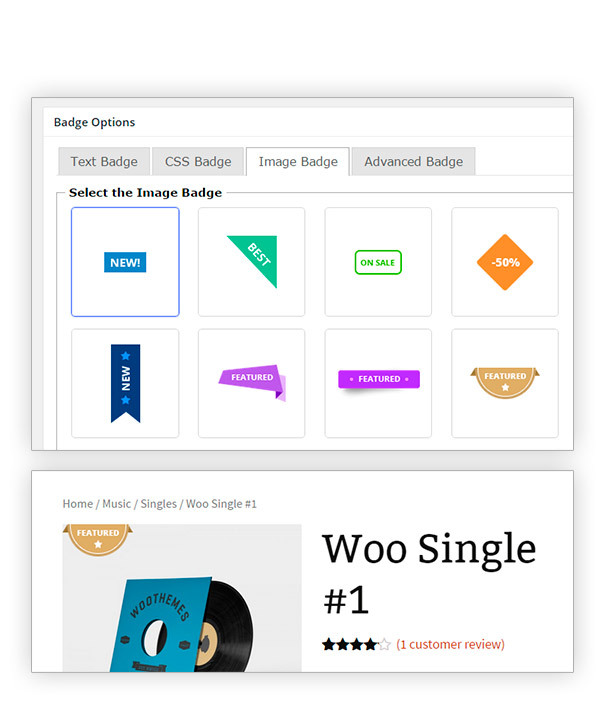 Use badges and product badging offered by YITH WooCommerce Badge Management. It puts many badges at your disposal, for different purposes, with high customisation possibilities, but also badges ready for your shop with a cared and innovative design made by YIThemes! Well, let's discover together how the plugin can improve you shop! First of all, I would like to remind you that badges are not just a game for children or colourful meaningless labels on products. They are your important message in the form of a colourful label! Yet, when we first enter a website, our first impression comes from our sight and we actually behave as children: we are attracted by colourful objects, by harmonious shapes and proportionate disposal of text, images and empty spaces. Yes, our brain analyses all this, without our knowing. And studies on product badging proved that it can improve sales exponentially. If we are not looking for something in particular, our mind is helped by badges in selecting just some products and not get lost among countless items that could all both interest and confuse us at the same time. YITH WooCommerce Badge Management can help you give prominence to some products in your shop, to special offers, by giving you the opportunity to create your own badges and customise them in colour, text, and other style options. You can choose to automatically show an ad hoc badge for all products you add to featured products. Or you can decide to automatically assign a badge to recently added products. You do not have to spend half of your time assigning new products the "new" badge and remove it from less recent ones. The plugin makes this in your place and you do not have to care about it. The plugin gives particular attention to an important category also: "On sale" products. As well as WooCommerce plugin gives special care to on sale products, the ones that most attract your customers, YITH WooCommerce Badge Management allows you to integrate badging to this special category. 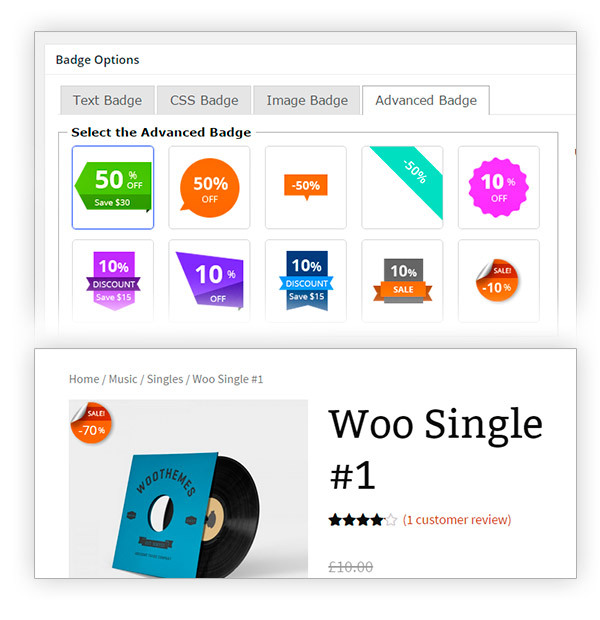 You can assign an "on sale" badge to all products that you mark as "on sale", you can replace default WooCommerce badge for them and make them stand out in your shop using a style that best meets your needs. 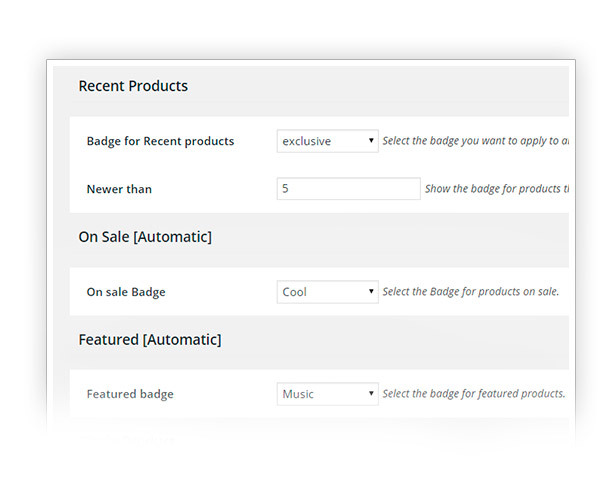 You can also assign badges for each single product category you select. 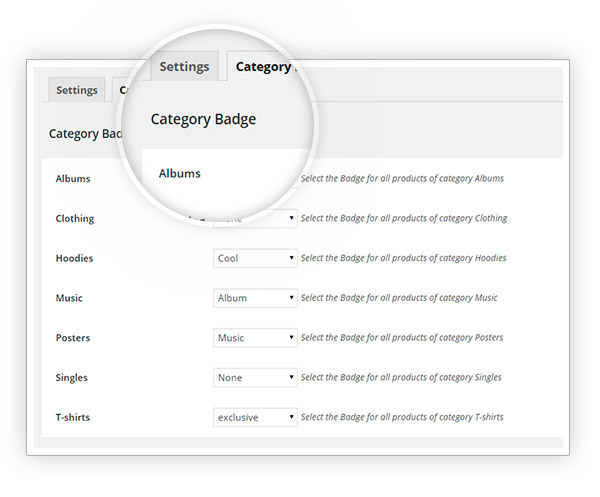 So, not only special badges for special categories, but also special badges for the categories you create. And, needless to say, all this can be managed in an automatic way. Total freedom for you! Manage badges for categories or give prominence to a single specific product, you do not have to choose either one or the other, you can all this! Put you want to feature the month product, which is given a 70% discount for a limited time: it must be totally different from other products and stand out a mile: it is a temporary offer, its price is well worth the money, and it looks much more convincing to your customers. If it is just one of the many, no one will notice it, but if you give it a special badge, your promotion price will have great effect. Badging must be carefully conceived, but if it is, it will make your sales a success! And you are granted a high degree of customisation too! Select text badge or image badge and set values for each of these two types. Image badges are a lot and with a fresh and impact style, the perfect one for your shop. If the ones you find with the plugin package are not enough for what you have in mind, then you can also upload your own image and create your badge entirely from scratch, specifying text, price and colour. While, if you want to select one of the many included in the plugin packet, you can't go wrong, because their colours have been chosen according to specific research and usability studies made on eCommerce websites. 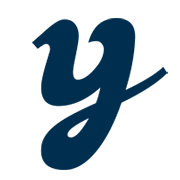 Nothing is random in it, and YIThemes has years of experience in this!  Well, if I were you I would not wait a second more to download the free version of YITH WooCommerce Badge Management and to discover all features it offers! Read more about this plugin features and more technical info in the official documentation.